Ming Na Wen at the Los Angeles premiere of the "Together." Ming Na Wen at the premiere of "The Lord Of The Rings: The Two Towers." Ming Na Wen at the premiere of Fox's "Welcome to Mooseport." Ming Na Wen at the Lili Claire Foundations' 2004 Las Vegas Benefit Gala. Ming Na Wen poses for the photographers at the NBC's 75th anniversary all-star reception. Ming Na Wen at the "Ratatouille" premiere. Ming Na Wen at the 18th Annual Aids Walk Los Angeles. Ming Na Wen and Jennifer Love Hewitt at the In Style/Warner Bros. post-Golden Globes party. Ming Na Wen at the Lili Claire Foundation 10th annual benefit dinner and auction. Ming Na Wen at the 20th Century Fox Television and FOX Broadcasting Company 2006 Emmy party. 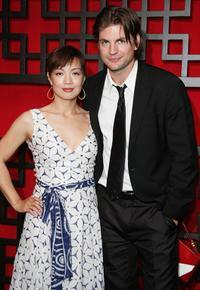 Ming Na Wen and Gale Harold at the FOX Broadcasting Company Upfront. Ming Na Wen at the 8th Annual Teen Choice Awards. Ming Na Wen at the NBC 2005 Television Critics Association Summer Press Tour, attends the panel discussion for "Inconceivable." Ming Na Wen at the opening of the new Morongo Casino.